Jason Mendelson was driving his Toyota Prius in the right lane of Interstate 64 near Richmond, Virginia, when a white pickup truck with two protruding smokestacks cut into the lane ahead. After a few moments, the pickup spewed a torrent of black smoke that enveloped his small car. The pickup sped away. Mendelson didn't think much of the odd interaction until a few minutes later, when the pickup returned and again left him in a cloud of smoke. "That's when I realized, 'Okay, this was on purpose,'" he said. 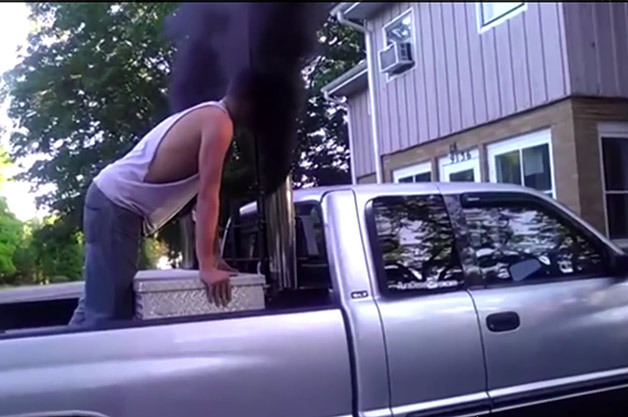 Indeed, he was the victim of a practice called "coal rolling" or "rolling coal," which if you're unfamiliar, is the equivalent of farting in someone's vehicular face. Own a diesel pickup truck, and you can spend somewhere between several hundred to several thousand dollars on modifications that make the vehicle capable of belching towers of black smoke on command, all for the apparent pleasure of leaving fellow drivers or pedestrians choking on a cloud of soot. Victims aren't usually chosen at random. Rather, coal rollers take particular delight in targeting drivers of green-friendly cars like the Toyota Prius, because rolling coal isn't always mere indiscriminate harassment, but a form of grassroots political protest against President Obama and perceived burdensome federal regulations. Coal rollers take particular delight in targeting drivers of green-friendly cars like the Toyota Prius. "I run into a lot of people that don't really like Obama at all," one coal-roller tells Slate, which detailed the practice at length. "If he's into the environment, if he's into this or that, we're not. I hear a lot of that. To get a single stack on my truck – that's my way of giving them the finger. You want clean air and a tiny carbon footprint? Well, screw you." This isn't the first time that clashes between conservatives and liberals have reached the automotive world. In 2012, one-time Republican leader Newt Gingrich took a swipe at the Chevrolet Volt, declaring on the campaign stump that "you cannot put a gun rack in a Volt." But it may be the first time that politics have been a root cause of everyday harassment of drivers on American roadways. YouTube is filled with examples of coal rollers providing footage of their brazen pranks (or brazen stupidity, depending on your perspective), many of them with hundreds of thousands of views. In one, a driver with a "Prius Repellent" sticker on his rear window, sends a billowing cloud of black smoke toward the Toyota hybrid behind him. In another, a young driver, under the headline of "This is what I think of hybrid cars," coal-rolls a Ford Fusion Hybrid that belongs to his parents. In another, between goofy giggles, a driver leaves a police cruiser in a black haze. In yet another, a driver doesn't attack a green-car driver, but a friend who happens to be sleeping in the cab of another vehicle – pranking friends and family is another running theme among coal rollers. There are countless examples that, collectively, provide an astounding look at the coal-rolling subculture. In recent days, the Environmental Protection Agency at the center of many coal rollers' angst has issued a statement saying that the modifications that enable rolling coal are illegal. "Tampering with vehicle pollution controls is against the law," an EPA spokesperson tells Autoblog. "Tailpipe pollution, uncontrolled by emissions reduction technology, contains high levels of soot and smog-forming chemicals, which are linked to premature death in people with heart or lung disease, aggravated asthma and other serious, negative health effects." Out on the road, there are no specific laws that prohibit rolling coal. The EPA says it has reached settlements with some of the largest manufacturers of defeat-device equipment, and that it aggressively enforces the relevant portions of the Clean Air Act. Out on the road, there are no specific laws that prohibit rolling coal, but there may be indirect traffic violations that result from the practice. Laws vary on a state-by-state basis, but conceivably, cutting off another driver or intentionally impairing their vision could result in a ticket. Some could run afoul of emissions regulations. In the meantime, motorists like Mendelson are left to fend for themselves. "It's illegal, but who is enforcing that? It would have to happen in front of a cop, so I don't think there's a whole lot that can be done," he said. "When someone pulls in front of you like that, it's a safety risk ... it's also a symptom of a greater underlying problem of intolerance combined with stupidity. It's disturbing that someone feels so threatened that they have to essentially attack someone they don't know, who can't defend themselves, who might not even have the views they think you do."